My mother had the Better Homes and Gardens Sewing Book, 1970 edition. I LOVED leafing through that book when I was a kid. The techniques were interesting to me even before I learned to sew, but the pages on putting together a wardrobe were absolutely fascinating. 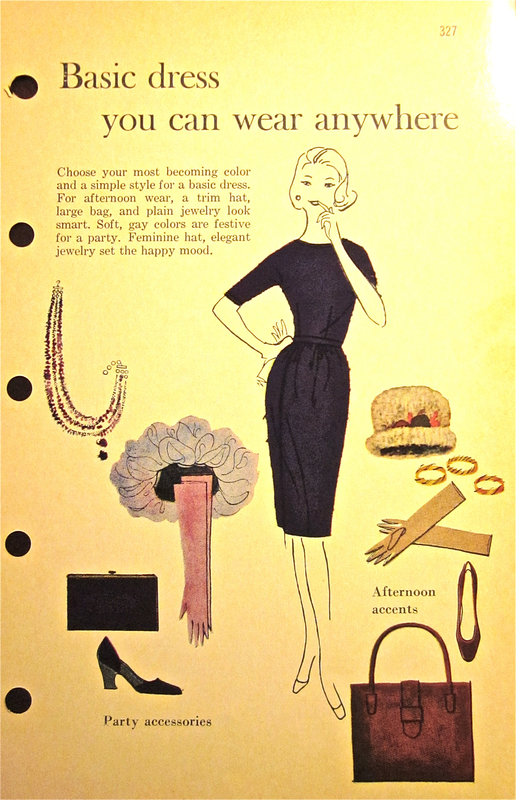 Even the “casual” looks were elegant. The purple fabric looks fantastic with the leopard accessories. This page makes my heart go pitter-patter. Nothing is classier than a tweed suit. I have to admit that the hats frighten me a bit, but the bags and shoes are beautiful. And why don’t we wear gloves anymore? They are so much more attractive than a little bottle of hand sanitizer. When I was in college, I’d sometimes go down to the basement of the school library to look at the Vogue magazines from the 1940s and 1950s. They were right out on the shelves. The women all looked so sophisticated. I spent several hours at the mall this afternoon, chauffeuring a couple of eighth-grade girls. 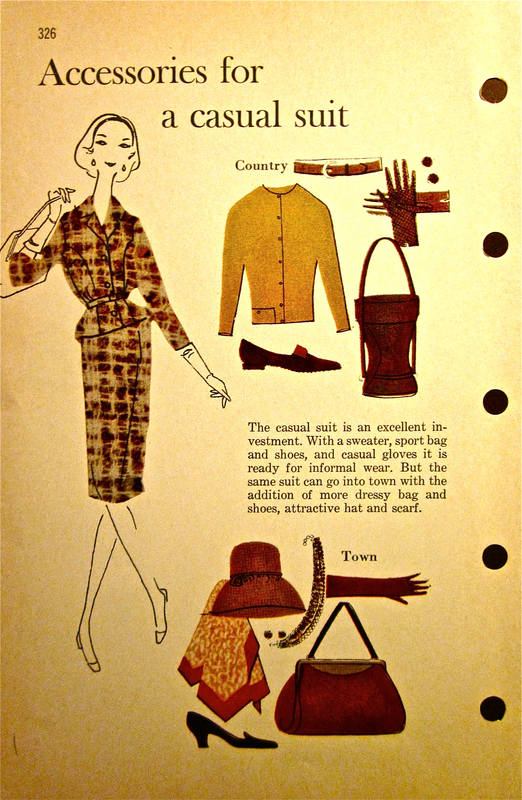 Although I picked up a camel cardigan and a cream sweater that would both look good with vintage-inspired pieces, the outfits on these pages are far more stylish than anything the mall had to offer. 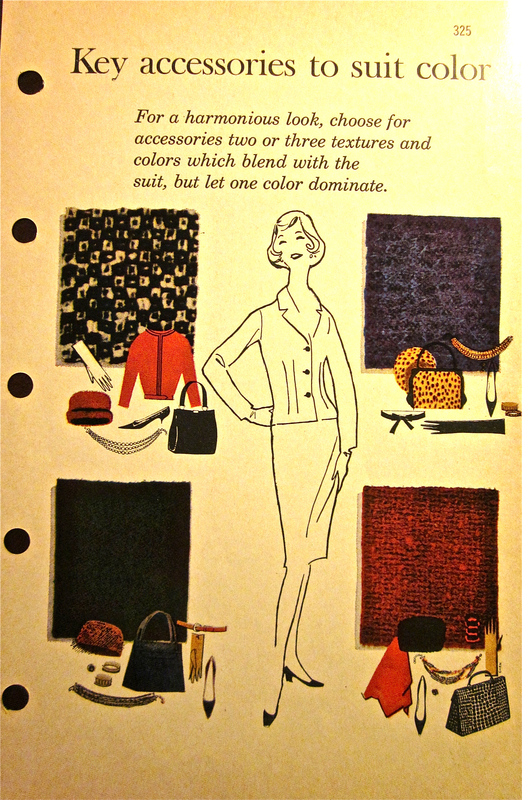 As I drove out of the massive parking lot, I felt happy not only that I can sew my own clothes, but also that I have vintage sewing books to turn to for inspiration, including one I first read more than 30 years ago. Such classic designs. I would love to own the dress and the skirt suit. Jess, I want everything on Page 326! Ever watch Perry Mason? It’s a parade of fabulous clothes. I have the first season and a half on DVD. I’ve heard of the show but have never seen it. I should check Netflix to see if they have it. If not, I may need to borrow your DVDs.